Dear guests, please note the signatures of the photos. So you can get a first impression of your chosen apartment. 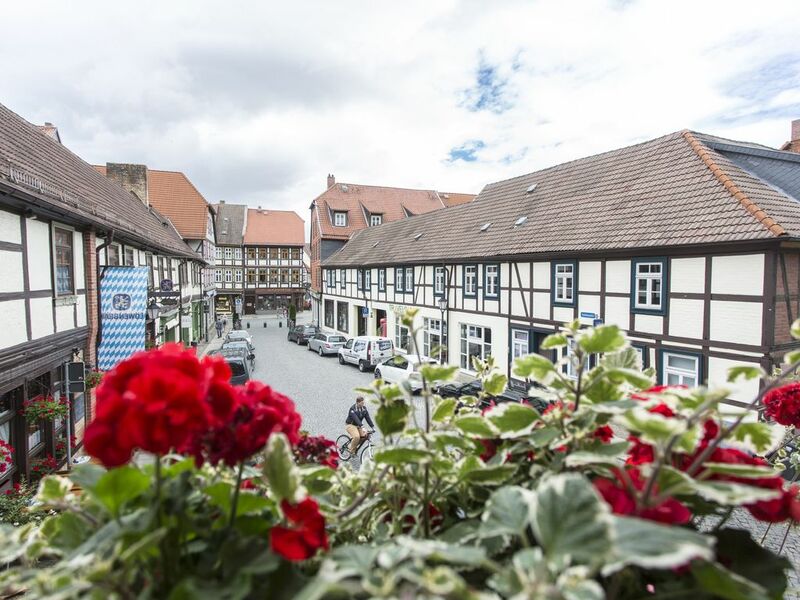 The Apartment "Town Hall" on the carbon market is located in the heart of the "colorful city" Wernigerode located on the first floor of our historic half-timbered house. This guest apartment is ideal for families with two children and holds for a full equipment ready. These include two bedrooms with spacious double beds. For your luggage, you will find enough space in the spacious wardrobes. A central point of the guest apartment is the living room. The couch invites you to linger, relax and common games evenings. Here also wonderful the next outing and hike can be discussed and planned. To do this, companies like our guide at hand, which for you is our apartment. The apartments on the coal market in the heart of the town of Wernigerode and make a perfect starting point for short excursions, extended day trips and an ideal starting point for a leisurely shopping and exploring the old town. True to the city motto: "The colorful town in the Harz", arise for Enterprising many ways. Even at city festivals you are close to the action and at the time of Wernigerode Christmas market you will be picked up by the festive atmosphere right on the doorstep of your holiday home. Wernigerode provides numerous offers for each guest. On our website, see "excursions" and "News" a first insight into the multi-faceted leisure, cultural and family deals. Further information can be found also at www. Wernigerode tourism. de. Let yourself be inspired by the diversity and experience the Harz on your way! Within walking distance from our holiday home, you have a parking space for each apartment for free use available. A loading and unloading of baggage is possible journey right outside the front door. In addition, included in the apartment price WLAN whose access is available on request upon arrival. The apartments have modern furnishings and subtle color concept creates a pleasant feel-good atmosphere during your stay with us. The interior of the apartments has been selected with great attention to detail and leaves no wish unfulfilled. The furniture is comfortable and color coordinated. The apartments on the first and second floors feature a generous daylight bath with bathtub and another bathroom with toilet and walk-in shower. Tasteful fittings and clean lines and a held in earth tones color concept of the bathrooms invite you to linger and relax. In the attic there is a window, which is also equipped with a walk-in shower and toilet and invites by its warm color game to feel good. The kitchens in all apartments offer high quality furnishings and offer plenty of space for cooking and feasting. Let yourself be inspired or prepare your favorite foods to the regional dishes. From our historic timbered building, our guests can see the resin at its best and experience. Applies To a the view from the bedroom windows, the carbon market and the action can be viewed around the restaurant Löwenbräu. Here regional meals are offered. The visitor gets in this way a first impression of the beautiful old town of Wernigerode and is invited to explore. Secondly, the front window allows the courtyard, where bathrooms and kitchens guest apartments are located, a wonderful view of Wernigerode Castle (except in the apartment City Hall). An impressive panoramic experience, especially in the summer evenings, when the castle is bathed in warm sunlight and emerges from the tops of the pine forest. Even in the snowy season shows the Wernigerode Castle his wintry charm and attracts visitors from your cozy accommodation. End of November of each year, the gates open of Wernigerode Christmas market, which may be among the most popular of the Harz region. The historic half-timbered houses are picturesquely in the winter landscape and provide a homely atmosphere. Lights, pleasant fragrance and needle Tannengrün accompany visitors through the old town, which is so wrapped up in cozy warm light. With a glass of mulled wine or roasted almonds in your hand you can explore the shopping streets or delight your palate with other regional Winterköstlichkeiten. Situated on the northeast flank of the resin Wernigerode is in every season a popular destination. Discover from the resin of our holiday. Each guest apartment we hold a guide for you, to assist you in your further travel planning. For questions we are at your disposal and look forward to welcoming you in our house ourselves. In addition to a generous daylight bath with toilet, double sink, lighted wall mirror and bathtub is another bathroom with toilet, windows and a walk-in shower. Thus, start relaxing every holiday. Stadtwohnung im idyllischen Zentrum von Wernigerode, wenige Gehminuten zum Markt, 10 min zum Bahnhof. Sehr sauber, wirkt frisch renoviert. 2 große Schlafzimmer, Essküche, Fernsehraum und wunderbare Badezimmer: ein großes, und ein riesiges! Das Gebäude ist etwas hellhörig, und die Einrichtung der Wohnung könnte gemütlicher sein. Aber das ist ja Geschmacksache. Der Wohnstandard, die Funktionalität und das Preis/Leistungsverhältnis sind ohnehin sehr gut. Wenn man 4,5 Sterne geben könnte, hät ich's getan. Sehr schöne helle Ferienwohnung, Küche mit allem ausgestattet, was man benötigt, sehr schöne und modern gestaltete Bäder. Die Schlafzimmer gehen nach vorne zur Straße raus, sind abends und in der Nacht ruhig, doch hört man morgens ab ca. 6 Uhr ab und zu einzelne Fahrzeuge. Hinten im Hof befindet sich die Gartenterrasse eines Restaurants, die man auch nutzen kann, selbst wenn man nicht das Restaurant besucht. Wir waren einmal im preislich günstigen Restaurant essen und waren sehr zufrieden. Der Restaurantbetrieb stört in keiner Weise. --- Die Kommunikation mit den Vermietern klappte einwandfrei. Alles in allem ein gelungener Aufenthalt. auszeichnet. Ein Wohlbefinden durch Ihre Freundlichkeit und der malerischen Landschaft. Alles was sich ein Urlauber zum erholen wünscht haben wir hier vorgefunden - D a n k e ! Sauberkeit, Betreuung ohne jegliche Beanstandung. The apartments on the coal market in the heart of the town of Wernigerode and make a perfect starting point for short excursions, extended day trips and an ideal starting point for a leisurely shopping and exploring the old town. True to the city motto: "The colorful town in the Harz", arise for Enterprising many ways. Even at city festivals you are close to the action and at the time of Wernigerode Christmas market you will be picked up by the Christmas spirit right at the front door.